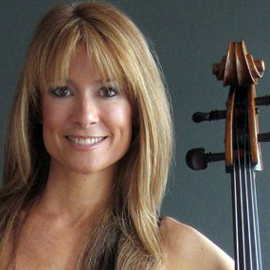 Grammy Award-winning cellist SARA SANT'AMBROGIO first leapt to international attention when she was a winner at the Eighth International Tchaikovsky Violoncello Competition in Moscow, Russia. As a result of her medal, Carnegie Hall invited Ms. Sant'Ambrogio to perform a recital that was filmed by CBS News as part of a profile about her, which was televised nationally. The New York Times described Ms. Sant'Ambrogio's New York debut as "sheer pleasure," saying There was an irresistible warmth in everything Miss SantAmbrogio did." Ms. Sant'Ambrogio has appeared as a soloist with such orchestras as Atlanta, the Beijing Philharmonic, Boston Pops, Budapest, Chicago, Dallas, Moscow State Philharmonic, the Prague Chamber Orchestra, the Osaka Century Orchestra (Japan), The Royal Philharmonic, St. Louis, San Francisco and Seattle; she has performed thousands of concerts on six continents at the worlds major music centers and festivals including Aspen, Concertgebouw in Amsterdam, Hollywood Bowl, Lincoln Center, Kennedy Center, the Konzert Huset in Stockholm, Marlboro, Mostly Mozart, Musikverein in Vienna, Ravinia, Orchard and Suntory Halls in Tokyo and Great Mountain Festival in Korea. Ms. Sant'Ambrogio is a founding member of the Eroica Trio. The Trio won the prestigious 1991 Naumburg Award, resulting in an acclaimed Lincoln Center debut and has since extensively toured the United States, Europe, Asia, the Middle East, Australia, and New Zealand. In 1997 the Trio opened the "Distinctive Debuts" series at Carnegie Hall, and that year represented Carnegie Hall as the official chamber music ensemble in concerts worldwide. While touring the globe, Eroica has released eight celebrated recordings for Angel EMI Classics Records, garnering multiple Grammy nominations.